(Bloomberg) -- Bitcoin climbed suddenly on Tuesday to the highest level since November, shattering a three-month stretch of calm for the world’s most popular cryptocurrency. 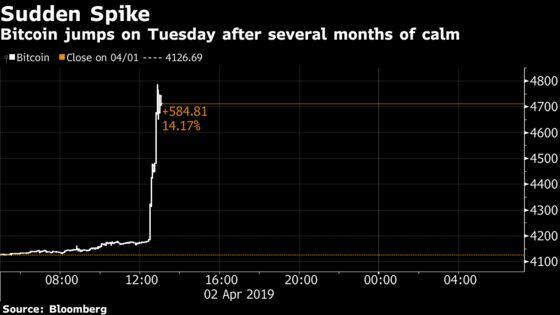 It advanced as much as 16 percent to $4,787.30 as of 12:58 p.m. in Hong Kong, according to Bloomberg composite pricing. Rival coins including Ether, Ripple and Litecoin also jumped. While sudden swings in Bitcoin are nothing new, trading in the virtual currency has been unusually subdued this year as investors weighed the prospects for more mainstream adoption after last year’s 74 percent crash.